Actemra (tocilizumab) is an injectable immunosuppressant drug primarily used to treat rheumatoid arthritis (RA). Its side effects include runny nose, headache and high blood pressure. Though rare, the drug can also cause deadly infections, allergic reactions and gastrointestinal perforation. Unlike competitor RA drugs, Actemra’s label does not warn of other serious side effects like heart failure and stroke, though research shows these adverse events have occurred. Side effects listed in Actemra’s label range from injection site irritation and cold-like symptoms to life-threatening allergic reactions and gastrointestinal (GI) perforation. The injectable rheumatoid arthritis drug also carries a black box warning about a risk of serious, sometimes fatal infections. Research and analyses of the U.S. Food and Drug Administration’s Adverse Event Reporting System (FAERS) suggests there may be other potentially serious risks not included in the label, such as cardiovascular risks, pancreatitis and interstitial lung disease. An investigation has shown these sometimes deadly side effects occurred at the same or higher rates in patients taking Actemra (tocilizumab) compared to those taking other RA drugs like Humira, Enbrel and Remicade. Common side effects of Actemra are usually not serious, but patients should speak with their doctor if these side effects persist or become bothersome. The most common side effects reported during clinical trials affected 5 percent or more of the people taking part. Manufacturer Genentech warns doctors to use platelet and neutrophil counts and liver function tests to monitor patients taking the drug because sudden changes in these levels can indicate serious health complications. Some patients who took Actemra in clinical trials reported gastrointestinal perforation, which is a hole in the wall of the stomach or intestines. Many of these patients suffered inflammation or infection of pouches in the colon known as diverticulitis. The drug’s label warns that individuals at an increased risk for GI perforation should be cautious when taking the medication and should report any new abdominal symptoms to their doctor. Gastrointestinal perforation — also known as ruptured bowel — is a hole in the wall of the gastrointestinal tract. Medical data company eHealthMe publishes and routinely updates an analysis of FDA reports involving Actemra and GI perforation. From when the FDA first approved the drug in 2010 through February 2019, a total of 29,638 people had reported side effects when taking the drug, according to the analysis. In all, 0.72 percent had intestinal perforation. 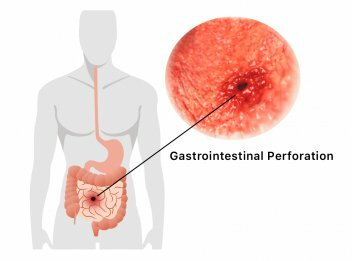 Of the 212 people who reported GI perforation, about 36 percent experienced the side effect within one to six months of starting treatment. Another 20 percent of affected patients suffered from the condition within one to two years of first taking the drug, while 18 percent reported having the issue within two to five years of their first dose. Women were almost four times more likely to have GI perforation as a side effect compared to men, according to the analysis. More than 63 percent of people affected by the condition were aged 60 and older. Diverticulitis was also present in more than 15 percent of those who had GI perforation. Genentech added fatal anaphylaxis to the drug’s label in 2011 after two people died of severe, life-threatening allergic reaction. According to the label, an allergic reaction to tocilizumab can happen even when patients have not previously reacted to the drug. 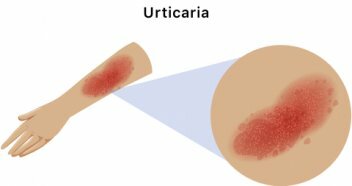 During clinical trials, some participants had to quit taking Actemra because they developed a skin rash with red itchy bumps or hives known as urticaria. Not all allergic reactions to tocilizumab are deadly, but some patients in clinical trials had to stop taking the drug because of allergic reactions. These reactions included erythema (redness of the skin) and urticaria (skin rash with red itchy bumps or hives). Research has also found tocilizumab can increase a person’s likelihood of getting an infection or it can make current infections worse. Some people taking the medication have been hospitalized or died from infections, including tuberculosis, and bacterial and viral infections. Reports also identify fungal infections like candidiasis, aspergillosis and pneumocystis. Hepatitis B infection may occur in people who take Actemra and carry the virus in their blood. Doctors may order blood tests before and during treatment. It’s important to tell your doctor if you feel tired, lose your appetite or have clay-colored bowel movements. Other symptoms to watch for include vomiting, chills, dark urine, stomach discomfort, skin rash, fever, muscle aches, and yellow skin or eyes. The drug’s label advises patients to avoid live vaccines because there has not been enough research to determine if live vaccines could lead to infection while on the drug. Because of the way tocilizumab works, it may interfere with how the immune system processes new vaccinations. The label recommends patients get up-to-date on all vaccines before starting treatment. People taking tocilizumab may be at an increased risk of certain cancers. Researchers observed these cancers in clinical trials. Actemra’s label warns patients to tell their doctor if they have “ever had any type of cancer” before starting treatment. Tocilizumab is an immunosuppressive drug. These types of drugs “make the immune system less able to detect and destroy cancer cells or fight off infections that cause cancer,” according to the National Cancer Institute. However, a 2016 study published in Rheumatic & Musculoskeletal Diseases Open found no increased malignancy rates among patients taking tocilizumab. Researchers looked at 4,009 patients being treated with the drug. They reported “malignancy types and rates were consistent with those expected” in rheumatoid arthritis patients. The drug’s label also warns that multiple sclerosis has been diagnosed in people who take the drug – though it is rare. The medication’s potential effect on some nervous system disorders is unknown. In 2017, the medical news organization STAT examined a half million adverse event reports on rheumatoid arthritis drugs. Its investigation found “clear evidence” that patients who took Actemra had as high or higher risk of having a heart attack, stroke or heart failure compared to patients who took other arthritis medications. The arthritis drugs Humira and Remicade list heart attack and heart failure as risks on their labels, while Humira also lists stroke. Actemra’s label does not warn about these risks. Experts reviewed the data and concluded that the FDA should “immediately consider warnings for heart failure.” But as of November 2018, the federal agency had not yet required an update. The STAT article quoted a transcript of a 2008 meeting of FDA scientific advisers. The meeting was to debate whether to recommend the FDA approve Actemra. “I can foresee the possibility that in five years there’s another hearing like the one on Vioxx, where the cardiologists … say to us, what were you guys thinking when you approved this drug?” Dr. David Felson, Boston University rheumatologist and FDA scientific adviser said during the 2008 meeting. A study presented at the 2016 American College of Rheumatology Annual Meeting compared tocilizumab to another rheumatoid arthritis drug, etanercept — also known by the brand name Enbrel. The study involved patients who were older than 50 years old, who had at least one cardiovascular risk factor or who had a history of a cardiovascular event. The researchers found a 5 percent increase in relative risk of a major cardiovascular event for Actemra users compared to Enbrel users. All 11 authors of the study disclosed financial connections to Roche, Genentech or both. Five of the researchers were employed by either Roche or Genentech. Another 2017 study in the journal Arthritis and Rheumatology found that the medication may be causing cardiovascular conditions at similar rates — but not at increased rates — to other drugs that already carry a warning. Researchers at Brigham and Women’s Hospital in Boston along with Genentech staff researchers in San Francisco conducted the study. A February 2019 eHealthMe analysis of FDA reports found about 43 percent of heart failures and nearly 29 percent of heart attacks that happened in patients taking Actemra occurred within one month of the first dose. About 27 percent of strokes were reported within the first month, according to the analysis. The company also found that more than 2 percent of all adverse event reports associated with the drug were for heart attacks, heart failure or stroke. An analysis from eHealthMe found pancreatitis affected 0.4 percent of the 29,638 Actemra users who reported side effects to the FDA between 2010 and February 2019. The analysis showed half of all pancreatitis cases developed in the first six months of starting Actemra. It also found women reported 70 percent of pancreatitis side effects. About 70 percent of reports of pancreatitis and 72 percent of reports of interstitial lung disease involved women. A November 2018 analysis from eHealthMe showed interstitial lung disease accounted for 1.65 percent of all Actemra adverse event reports to the FDA. The analysis found nearly 58 percent of patients in the reports developed interstitial lung disease within the first six months of taking the drug. Women accounted for 72 percent of those reporting the condition. Actemra’s drug label does not warn of either possible side effect. Related drugs Humira and Remicade both carry warnings for interstitial lung disease. Humira also lists pancreatitis as an adverse reaction identified during post-approval use. The FDA received reports on 1,128 people who died after taking tocilizumab, according to the June 2017 STAT article. Deaths associated with the medication occurred from stroke, heart attack, heart failure, pancreatitis, infection, bowel perforation, severe allergic reactions and other serious side effects. 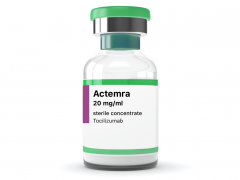 The investigation suggested Actemra may not be more dangerous than other arthritis drugs on the market, but that it is being misrepresented as a safer alternative to drugs like Humira, Enbrel and Remicade. These other drugs contain warnings on their labels for various fatal side effects, but Actemra’s drug label does not warn consumers or doctors of these risks. Lawyers are preparing to take legal action on behalf of people whose family members died while taking the medication.